If you are the American military and you have secured a base on an island in the middle of a depopulated and still-dangerous London, and you are filling said island up with civilians, and you tell them they MUST NOT under ANY CIRCUMSTANCES leave said island to go exploring, you’ll sort of just assume that they’ll listen. You won’t, you know, post any guards at the ends of the bridges that lead to London, you’ll just put them in the middle of the bridge, where they’ll chitchat with each other instead of keeping an eye out to make sure a couple of kids aren’t sneaking away. After a sniper on top of a nearby building finally does spot the kids exiting the bridge, it will take you so long to formulate a response that said kids will have time to wander around London, find an abandoned moped, find the keys, and drive all the way to their old house before you can manage to get a helicopter to their location. You will tell this survivor’s husband that you found his wife, but it evidently won’t occur to you that he might try to sneak in and see her. Which he can do, on account of he’s the civilian facilities manager and so of course you gave him a key card that opens ALL THE DOORS in the military medical facility, including in the quarantine area. Because, you know, he might need to change a light bulb in there or something. If you’re on the run with a kid who may have a genetic abnormality that enables him to carry the rage virus asymptomatically, thereby making him (1) a potential source for a treatment or a vaccine but also (2) a potential Typhoid Mary, you won’t tell anyone except for the military sniper who’s protecting you. Telling this guy is actually not a bad idea, because he has a radio. However, he won’t use said radio to pass the information along to anyone else, for instance, the helicopter pilot who is planning to airlift you all to safety. You also won’t tell the kid, because why worry him? 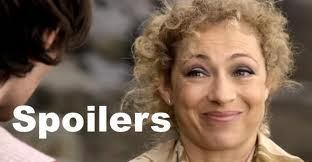 I could go on and on, but let’s just say there’s a reason the “Idiot Ball” entry for “28 Weeks Later over at the much-loved tvtropes.org site is the largest section of the film’s writeup, closely followed by “Too Dumb To Live“. With that, I think I will give the last word to someone who knows a thing or two about how to deal with zombies. 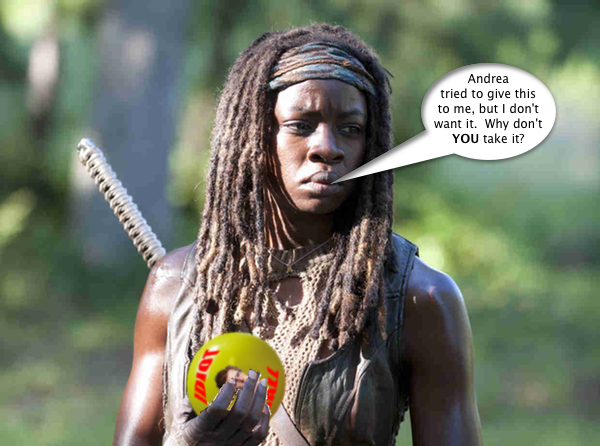 Michonne does not accept your gift of an Idiot Ball. *I realize the infected in “28 Days Later” are not technically zombies on account of they’re not actually dead. But they still brought on the fast zombie apocalypse. Bwaaaaa ha ha ha! Now I want to see it just to see how bad it really is!